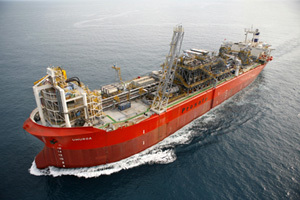 The Umuroa is a floating platform storage and offload (FPSO) facility located in the Tui oilfield off the Taranaki coast. It was turret-moored in a water depth of 120 meters and was designed to handle up to approximately 120 000 barrels of liquid per day. On board oil storage capacity is in excess of 700 000 barrels. In November 2005, Prosafe was awarded a contract by New Zealand Overseas Petroleum Ltd for the provision of an FPSO for the Tui field. The field comprised of four horizontally drilled and subsea completed wells which were to be tied back to a leased Floating Production Storage and Offtake (FPSO) vessel called the Umuroa. Contract Instrumentation Services was subcontracted by JLE Electrical who in partnership with New Plymouth based Robt Stone & Co Ltd, assisted ProSafe Production with the offshore hook-up and commissioning of the facility – a converted Suezmax oil tanker previously know as M/T Ionikos. The project comprised of significant electrical instrumentation and automation duties in completing carryover work, as well as the pre-commissioning of field instrumentation and shutdown systems controlling the process, utility and gas treatment systems. Contract Instrumentation Services Ltd primarily assisted JLE electrical with the instrumentation side of the project and had two contract technicians living on the vessel for some period of time.